The Saint Paul Almanac continues its year-round literary celebration of Minnesota’s capital city with the acclaimed Lowertown Reading Jams. Just in time for St. Patrick’s Day, the March presentation of the eclectic series, curated by Carol Connolly, features readings by six of the finest poets and performers of Irish descent working in Minnesota today. 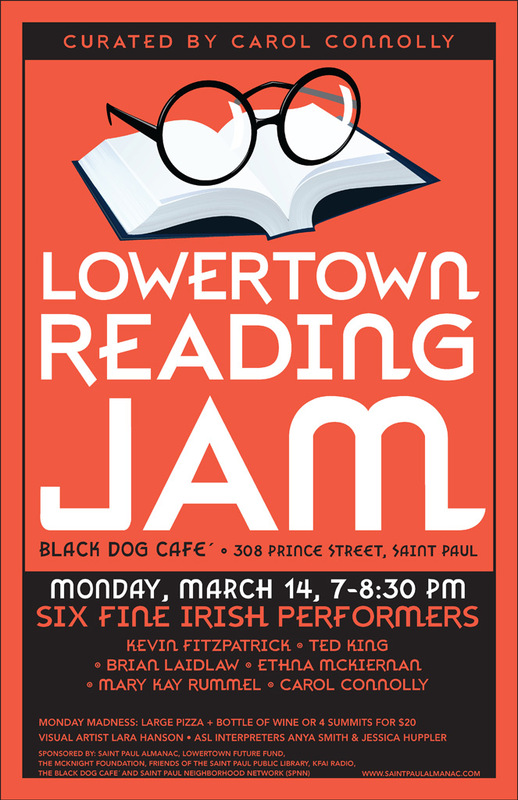 The all-Irish Reading Jam will be presented on Monday, March 14, 2011 from 7 to 8:30 p.m. at the Black Dog Coffee and Wine Bar, 308 Prince Street in Saint Paul. The Jams will continue on the second Monday of each month through July. CAROL CONNOLLY is Saint Paul’s Poet Laureate, appointed by Mayor Chris Coleman. She will emcee and read from her new book All This and More (Nodin Press). 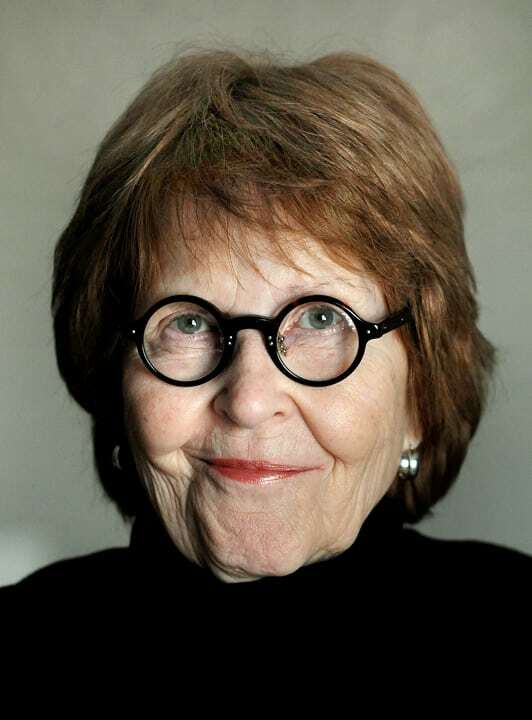 Connolly writes the “Hearsay” column for Minnesota Lawyer and was recently named the 2011 recipient of the Minnesota Book Awards’ Kay Sexton Award in recognition of her long-standing dedication and outstanding work in fostering books, reading, and literary activity in Minnesota. KEVIN FITZPATRICK, poet and author of Down on the Corner and Rush Hour (Midwest Villages and Voices), and Greatest Hits 1975 to 2000 (Pudding House Press), is a founder and was editor of the Lake Street Review, a highly regarded literary magazine, now extinct. Widely published in literary magazines and anthologies, his poems have been read by Garrison Keillor on The Writer’s Almanac. BRIAN LAIDLAW, poet and folksinger, is from San Francisco. His lyrics have appeared in American Songwriter Magazine, and his poems appeared or are forthcoming in New American Writing, FIELD, Quarter After Eight, The Iowa Review, and elsewhere. He was the recipient of the 2009 Gesell Award for Poetry and a finalist for the 2010 Loft Mentor Series. Laidlaw is completing an MFA in poetry at the University of Minnesota. He teaches songwriting at McNally Smith College of Music. ETHNA McKIERNAN, poet, whose book The One Who Swears You Can’t Start Over, from Salmon Publishing in County Clare, Ireland, follows her Minnesota Book Award nominated Caravan (Midwest Villages and Voices), is widely published in anthologies here and in Ireland. Her new book, Sky Thick with Fireflies, also from Salmon, is set for October release. MARY KAY RUMMEL, poet, will read from her new book, Sometimes What’s Left is Singing (Blue Light Press). Earlier collections include Love in the End (Bright Hill Press), Illuminations (Cherry Grove Collections), Green Journey; Red Bird (Loonfeather Press), Long Journey Into North (Juniper Press) and This Body She’s Entered – a Minnesota Voices Award winner from New Rivers Press. Rummel is a University of Duluth professor emeritus, and teaches at California State University, Channel Islands. Her poems trace a woman’s passionate search for illumination, which began with her personal exploration of the Book of Kells. July 11, 2011 – Diego Vázquez, Jr.
Now in its fifth edition, the Saint Paul Almanac features essays, poems, photos, maps, and listings of events, bars, restaurant, theaters, and other cultural venues within a datebook format. The 2011 Almanac features 129 works by 118 writers. These writers include literary giants, everyday residents, students, journalists, new Americans, and lovers of Saint Paul who live in other corners of the world. Writers interested in having their work considered for the 2012 Almanac have until March 1, 2011 to make a submission. Information on upcoming events, how to make a submission, and other Saint Paul Almanac news is available at www.saintpaulalmanac.org. The 2011 Saint Paul Almanac sells for $11.95 online at www.saintpaulalmanac.org, and is available in independent and mainstream bookstores everywhere, as well as at libraries and coffee houses throughout the City. Saint Paul Almanac activities are made possible, in part, by funds provided by the Metropolitan Regional Arts Council from an appropriation by the Minnesota Legislature. Sponsors and partner organizations include the Black Dog Café and Wine Bar, the City of Saint Paul and Saint Paul STAR Program, Clouds in Water Zen Center, The Friends of the Saint Paul Public Library, KFAI Radio, The Lowertown Future Fund of the Saint Paul Foundation, the McKnight Foundation, Saint Paul Neighborhood Network (SPNN), Travelers Arts & Diversity Grant, and Twin Cities Daily Planet.